According to the French philosopher Albert Camus, life is absurd. Not silly or screwy or goofy, but fundamentally absurd, at the deepest level. His reasoning is pretty straightforward: the world doesn’t make sense and never will, but we humans can’t stop ourselves from desperately wishing and often pretending that it does, and so we experience a perpetual, gnawing disappointment that we can’t escape or articulate. Don’t despair, though; it makes for great theatre. There’s strange sort of thrill in nihilism for me. I’m not inclined to believe that life is meaningless — who is? — but I find it an exciting shock to the system if I can take on the potential, even for a few minutes, that all theories and ideas are just soothing constructs designed to insulate people from the brutal truth of existence. The Misunderstanding is a great opportunity to feel horrified by futility. It’ll make your chest squeeze and your skin crawl. 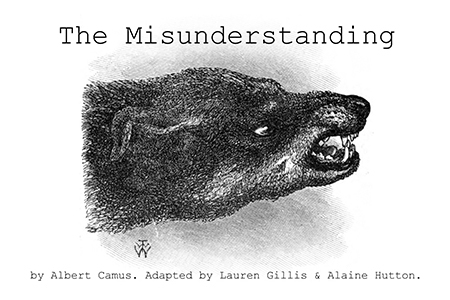 But beyond the nightmarish hollowness that may or may not lie at the heart of our experience of life on earth, which we can never really bear to contemplate and which Camus’s script evokes, The Misunderstanding is also just a brilliantly creepy play. Many surreal stage elements combine with excellently realized lighting (Linn Oyen Farley) and sound design (Wesley Mackenzie) to create a truly unsettling atmosphere that perfectly supports the sinister plot. The actors all seem uniquely well-suited to their roles, which is a testament to their skill, but I think the greatest strength of all three performances is their physicality. The dialogue is spare, mainly serving to carry the plot and deliver a number of harshly funny exchanges, and so most of the communication occurs in the actors’ movements and body language. The staging is impressive and the script is interesting, but it’s the actual physical embodiment of the characters that transmits the emotion and makes this play so affecting. Alaine Hutton, artistic director of Lester Trips Theatre, plays the daughter with a brittleness that seems perpetually on the verge of shattering. The awkward rigidity of her posture betrays the rage that she struggles to contain. Meanwhile, Justin Miller plays the son with gangly sincerity, puffing himself up and putting on airs to hide his nervousness. The actor who plays the mother — listed in the playbill only as “The Mother” — is a wafting, drunken mess, swooping and swaying around the stage and doing her best to stay floating above a lifetime’s collected bitterness. The Misunderstanding is an excellent example of a contemporary theatre company using innovative techniques to explore a classic work of drama. It does end with a lurch, however, so much so that the cast doesn’t even come out for a bow. Certainly Camus wasn’t going to write a happy ending, and it fits with the play, but it’s still a bit disappointing. Like life, I guess. The Misunderstanding is playing until September 13 at the Helen Gardiner Phelan Playhouse (79 St. George St). Tickets are $15 and $10 for students and arts-workers, and can be reserved in advance by emailing lestertrips.tickets@gmail.com .